The first Lego Movie was understandably overpraised for simply not being as terrible a corporate cash-in as it could have been. Unlike its predecessor, the Duplo double-dip that is The Lego Movie Part 2: The Second Part is borderline legitimately great. Instead of reductive Disney-barf themes like “don’t lose your imagination” and “working parents neglect their kids,” Lego 2 grapples with the origins of toxic masculinity and the perils inherent in modern narrative fiction’s obsession with dystopia. It also features Richard Ayoade voicing a suit-wearing ice cream cone and Noel Fielding as a sparkly vampire who DJs, so it’s basically a polaroid of heaven. Picking up immediately after the events of the first film, Lego 2 starts with an invasion of Duplo aliens who turn Lego utopia into what the National Parks looked like three weeks into the recent government shutdown. Five years later, Emmet (Chris Pratt) remains a gleeful, doe-eyed optimist while Lucy (Elizabeth Banks) and everyone else has embraced the dark-n’-gritty post-apocalypse. It’s Fury Road paved with foot-scarring, bumpy bricks. 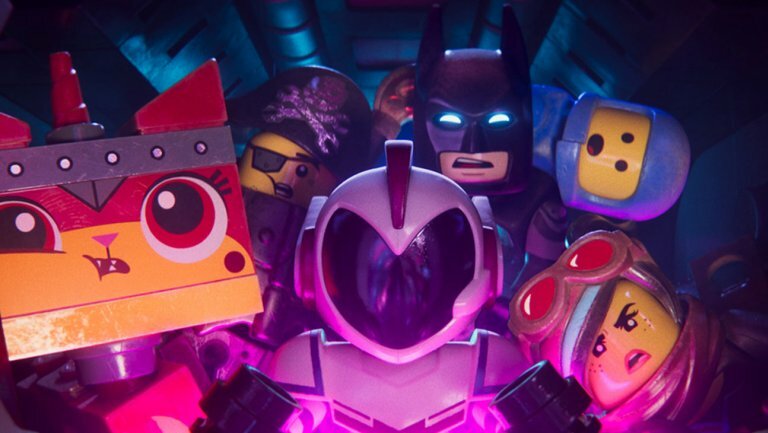 At the behest of Queen Watevra Wa’Nabi (Tiffany Haddish) from the Sis-tar System, General Mayhem (Stephanie Beatriz) kidnaps Batman (Will Arnett) for a “matrimonial ceremony.” Lucy, Unikitty (Alison Brie), Metalbeard (Nick Offerman), and Benny (Charlie Day) are also snatched, leaving only the kind-hearted Emmet to rescue them. With the help of swagger sergeant Rex Dangervest, Emmet aims to prevent the unification of the brooding Lego world created by an adolescent boy with the glittery world created by his younger sister. For about the first hour, Lego 2 vomits expected visual nonsense and pseudo-clever comedy. The inoffensive distraction fodder is occasionally interrupted by legit entertainment, such as any interaction between Superman (Channing Tatum) and Green Lantern (Jonah Hill). Once inside the Sis-tar System, the film pivots to something special, putting forth an argument with bilingual sophistication that speaks both kiddie and adult languages. In the Legoverse, Emmet is told in no uncertain terms that the journey into masculine adulthood should not be savage, cruel and dominant. In the real world, the pre-teen boy controlling the construction learns the value in non-testosterone-derived creative contributions. Please do not avoid this film because you fear it is quasi-propaganda. It isn’t. It’s not preachy or didactic, not done with finger wagging and chiding but with a few truly fantastic musical numbers and a character arc earned by Batman over these two films and his spin-off. Christopher Nolan can squawk and honk all he wants about effete cinematics, but the Lego Movies ultimately gave the caped crusader a more meaningful transformation. One of the best parts of Lego 2 is that the last half forgoes the ADHD gibberish that has come to define the franchise and its spinoffs in favor of downright pretty visuals and fresh comedy that will land with both breeders and their brood. The assertion that boys ought to grow up acknowledging their feelings and with kindness, imagination and compassion is neither a controversial argument nor one that is reinforced nearly enough. What a surprise to find that argument constructed out of the least likely materials.